Many years ago I was a member of a group that included some Birmingham Friends of the Earth members who travelled to a former coal mining community in South West Wales. There we spoke to members of a community cooperative in what was clearly an economically devastated area. 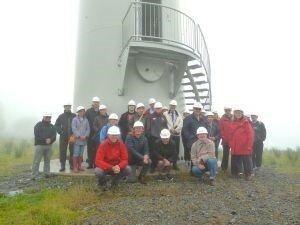 I remember the enthusiasm of the group and the inclusion of wind power in their sights. The community wanted to be part of the generation project and not just spectators of a commercial project. The project, Awel Coop, finally happened through a share offer and loans, the wind blows, the turbine turns, electricity is generated, and money is made. Now not all investment works out (Carillion etc), and Towy Timber is a green investment for another day. Well done Awel Coop (and they are now looking to pay off some loans through selling some more shares). Remember your money is at risk wherever you choose to invest.